8.15 Click on the stars to rate this FontStruction. How the wooden blocks look if the letters are cut from each? Info: Created on 16th June 2010 . Last edited on 23rd June 2010. An interesting concept - nice one. Congratulations! FontStruct Staff have deemed your FontStruction worthy of special mention. 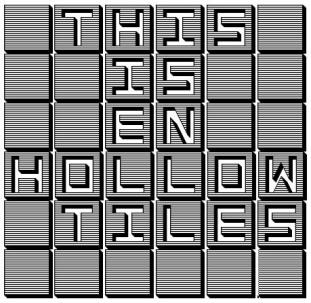 “en hollow tiles” is now a Top Pick. Thanks for the TP and for a old one.